There are benefits to sport participation, and it is important for parents to be aware of concussion risks, how to avoid them, and the signs when they may have occurred. Recognize, remove, rest and recover before returning to sport. Those are key points about sport-related concussion stated in the 5th International Consensus Statement on Concussion in Sport. The Canadian Guidelines on Concussion in Sport have been developed based on this statement and were recently released by Parachute Canada, a charitable organization focused on injury prevention, and its expert advisory group. The good news is that most people who suffer a concussion will recover in the initial days and weeks following injury. However, some will have ongoing symptoms. While concussions may occur in sport, there are many benefits to physical activity and sport participation for both youth and adults. I am a physiotherapist and researcher (assistant professor and clinician scientist) at the Sport Injury Prevention Research Centre, Faculty of Kinesiology, University of Calgary. My research focuses on the prevention and treatment of sport-related concussion in children, youth and adults, with special emphasis on the role of the neck and balance systems. A concussion is a type of a brain injury that occurs following a trauma to the head or body. Symptoms can come on immediately or may take hours to gradually evolve. The most common symptom following concussion is a headache. However, a number of other symptoms such as dizziness, nausea, fatigue, difficulty with concentration, neck pain and other complaints may also occur. Lying motionless, clutching the head, being slow to get up, wobbling and appearing dazed are some of the observable signs. In the event that a concussion may have occurred, it is important that the player is removed from the activity and has follow-up medical evaluation as soon as possible. A tool called the Concussion Recognition Tool 5 (CRT5) has been developed by the Concussion in Sport Group and is meant to help coaches, officials, parents and players recognize the signs of concussion. All individuals with a suspected concussion should see a health care professional with knowledge of concussion. The typical treatment is a short period of rest (24 to 48 hours, both mental and physical) followed by a gradual return to the typical activities that are done throughout the day. Following this, individuals may slowly increase their activity level using a graduated return-to-school strategy and return-to-sport strategy. The return-to-school strategy includes steps to gradually increase the amount of mental activity prior to returning to school. The return-to-sport strategy includes a series of steps that are performed sequentially, with each step taking a minimum of 24 hours. These include light aerobic exercise, sport-specific exercises, non-contact training drills and full practice prior to returning to play or sport. These two strategies can be performed simultaneously under the supervision of a health care professional. They take approximately one week to complete as long as the person with the concussion does not have any recurrence of symptoms. It is recommended that individuals return to school prior to returning to sport. Medical clearance should be obtained prior to returning to sport. 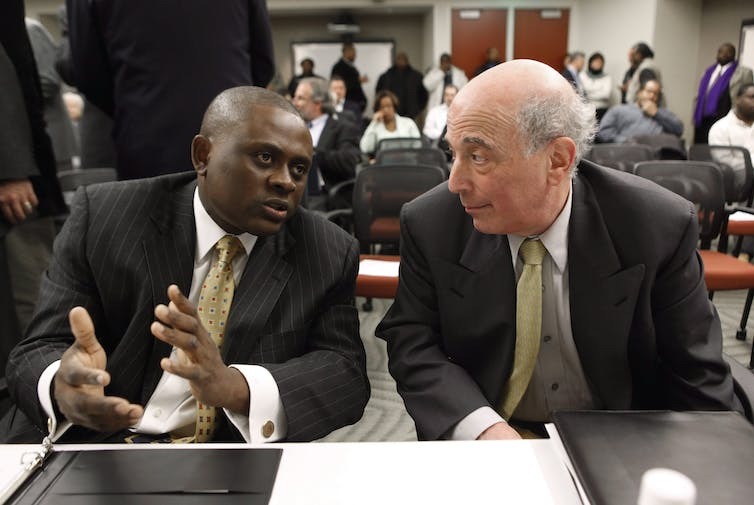 Dr. Bennet Omalu, left, is calling for parents not to enrol their children in contact sports. He discovered cumulative brain trauma from concussions in football players. In this 2010 file photo, he talks with neurologist Dr. Ira Casson, former head of the NFL Mild Traumatic Brain Injury Committee. Most people get better in the initial days to weeks following a concussion. However, for those who have ongoing symptoms and difficulties, there are some treatments that have been shown to help. My research has found that people with ongoing headaches, neck pain and/or dizziness and balance problems who are treated with physiotherapy techniques aimed at treating the neck and balance systems are more likely to be medically cleared to return to sport in eight weeks. There is also some research that low-level aerobic exercise may be beneficial following a concussion. Our research in this area is ongoing and we currently have a number of studies that are evaluating different types of treatments to help with recovery. Is there any way to prevent a concussion? The best way to minimize the impact of concussions is to prevent them. To do this, we first need to understand who is at the greatest risk. Research has shown that individuals who have had a previous concussion, who play games (as opposed to practice) and engage in contact sports all increase the risk of concussion. Many different sport associations are working to use research to inform rule changes to decrease the risk of concussion, including rules to disallow bodychecking in youth ice hockey nationally, in leagues for 11-to-12-year-olds (based on research led by Carolyn Emery). Another focus of my research program is to evaluate different pre-training strategies that may be used to prevent concussions. Concussions in sport are an area of much discussion. It is imperative that individuals with a suspected concussion are removed from play until they can be medically evaluated and do not return until they are cleared to do so. At this time, the literature on the long-term consequences of exposure to head trauma is inconsistent. Thus, more research is required to answer these important questions. The good news is that most people recover well following a concussion when managed appropriately. Awareness of the signs and symptoms of concussion, and appropriate initial management when a concussion may have occurred, are of utmost importance.